Gretchen Barretto admits flying to London whenever she misses her daughter Dominique. 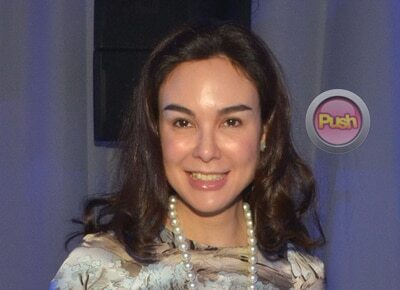 After celebrating her daughter Dominique's birthday in London last April 22, Gretchen Barretto admitted there came a time when she and partner Tonyboy Cojuangco went through the empty nest syndrome that most coupes feel when their children have left to live somewhere else. Their only daughter recently started her Fashion Design studies abroad earlier this year. “I was in London for a while and when I got home, kami na lang ni Tony sa isang napkalaking bahay. So I'm not complaining na napakalaking bahay namin, don't get me wrong baka ilipat ako ni Tony sa maliit na bahay pero sabi ko lang sa kanya, 'Siyempre pag umuwi ka at wala ang anak mo, it's not the same.' Yung ingay, it's just not the same. I can't enter her room when I'm in Manila and she's in London so what I do is there was one time where I just cried and cried. I said, 'Oh my God, I can't take it. I miss Dominique!' and Tony goes, 'Okay, stop it. Stop it.' So I flew out the next day (laughs),” she admitted. Gretchen said that now that her daughter is learning to be more independent, it has made her miss Dominique so much more. “Kasi nandun yung anak ko so every break I have andun ako. Sabi ko nun kasi I was feeling very sad when my daughter was going to London and sabi ni Tony sa akin, 'There's no reason to be sad. When you’re sad, when you miss her just fly to London.' So I tell him, 'I'm sad. I'm flying to London! (laughs)' and he goes, 'I'm sad too. Let's go fly to London! (laughs)” she joked. Currently busy working on her upcoming reunion movie with Richard Gomez, Gretchen said things are moving along with script revisions so that they can start filming later this year. When asked if she considered having another baby, Gretchen said she is more than content with her family right now. “I haven't really thought about that. Kasi it's going to be complicated to get into that. Tony's quite old na rin to really take care of it. I think we're fine, we're fine. I just miss Dominique when she's away. It's normal. Eh ganun naman ang buhay, madaming chapters. You just have to be prepared for every chapter. You have to move on, you can't look back. That's so old (laughs),” she said. Gretchen said she believes the Barretto family feud has already been put to rest and she has already moved on for good. “You know what, that's something I really would not like to talk about. Simply because I believe natigil na yung usapang pamilyang ganyan so to bring it up again, what for? Because it's not important anymore. We've moved on at saka it's been a year. Things change, people change, enough is enough. We have become very positive, we have been living and leading quite a comfortable life, peaceful life. To deal on negative things, what for? What will we achieve? I've said my peace. I am happy, don't make me unhappy. Just don't bring back the past. It's pointless it's a happy occasion. It's part of my past. I like my present and I'm looking forward to a great future, not only for me but for my daughter, so stop. Nagsalita na ako noh, paulit-ulit para naman akong matanda. Matanda lang yung nagpaulit-ulit noh (laughs). Happy naman eh, hindi pa ba happy ito? Pag magreklamo pa ako sa buhay ko ewan ko na, may problema ka na di ba?” she said.